The Hindu holy men have traveled from across India, arriving at a centuries-old temple overlooking the Brahmaputra River, not far from where the plains give way to the Himalayan foothills. They have come, with tens of thousands of other devotees, to worship at the annual monsoon festival for the goddess Kamakhya. And twice a day, most twist their bodies in ways most of us would find impossible. In yoga, they say, they found ways to soothe their bodies and their minds, honing a discipline most have practiced since they were children. Sunday marks the first International Yoga Day, which the government of Prime Minister Narendra Modi is marking with a massive outdoor New Delhi gathering. 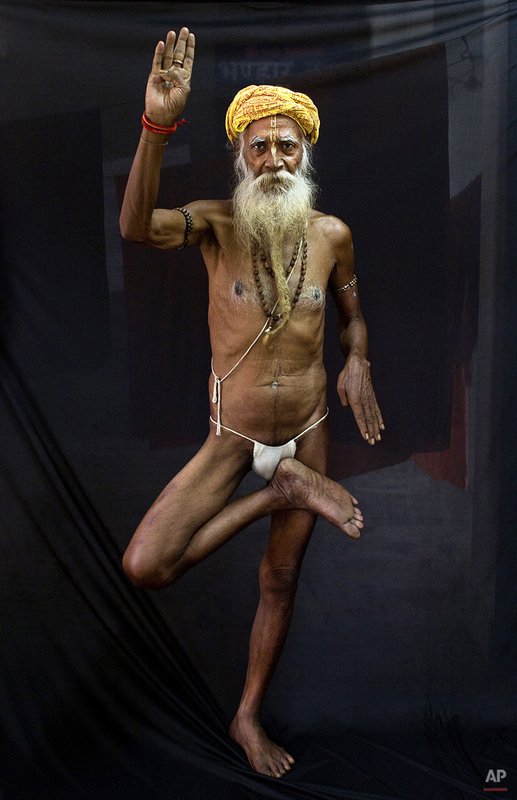 But for these men, yoga is something to be done every day. There is the Padmasana, the famed Lotus pose, where the legs are crossed and the feet rest on the thighs. It calms the mind, they say, and improves their health. There is a sort of half-headstand, where the yogi lies on his back and puts his crossed legs in the air. There is the Baddha Padmasana, or Locked Lotus, where the arms are twisted around the back. That one, says Mahant Ranjitanand Giri Maharaj, takes years of training. But it stimulates the thyroid and the kidneys, he insists, and helps with chronic migraines. Maharaj, a round 33-year-old, has had plenty of years to practice. He joined a brotherhood of holy men at age 7. He spends nearly all his time traveling across India, preaching and raising money for his sect. But nearly every morning before the sun comes up, and in the afternoon before it sets, he practices yoga for an hour. Mostly, he does it by himself. But when he attends a major festival like the one at the Kamakhya Temple, he and the other holy men go through their poses together. It is good for the mind, he says, and good for the body. Plus, he adds, yoga "is the best way to find God." Text from the AP news story, AP PHOTOS: Indian Yogis Twist Bodies, Soothe Minds, By Anupam Nath.